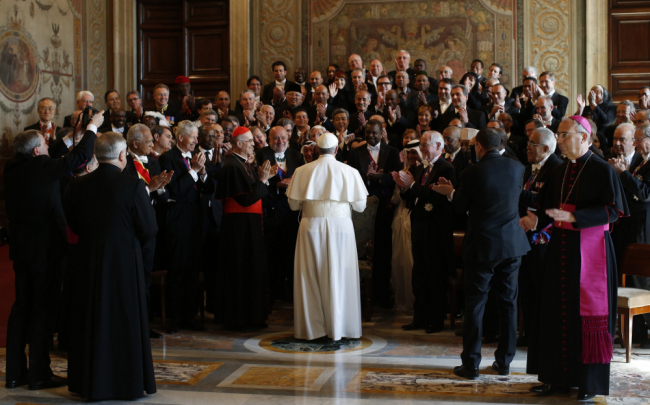 16 May 2013 – Earlier today, the Pope received a group of four new ambassadors to the Holy See for the presentation of their credentials. 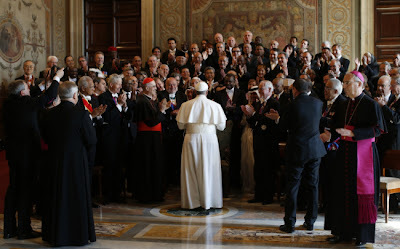 Per custom for the pontiffs, Francis gave an address on issues of geopolitical concern. Yet while his predecessors would tailor their remarks to issues in the home-countries of the diplomat(s) being welcomed, the new Pope targeted what's long been one of his key focus-areas – the poor, and their treatment in the economic system. Concealed behind this attitude is a rejection of ethics, a rejection of God. Ethics, like solidarity, is a nuisance! It is regarded as counterproductive: as something too human, because it relativizes money and power; as a threat, because it rejects manipulation and subjection of people: because ethics leads to God, who is situated outside the categories of the market. These financiers, economists and politicians consider God to be unmanageable, unmanageable even dangerous, because he calls man to his full realization and to independence from any kind of slavery. Ethics – naturally, not the ethics of ideology – makes it possible, in my view, to create a balanced social order that is more humane. In this sense, I encourage the financial experts and the political leaders of your countries to consider the words of Saint John Chrysostom: “Not to share one’s goods with the poor is to rob them and to deprive them of life. It is not our goods that we possess, but theirs” (Homily on Lazarus, 1:6 – PG 48, 992D). On a related note, it's worth recalling that Villa Richardson – the seat of the US' ambassador to the Holy See – remains vacant following Miguel Diaz's departure early this year for a professorship at the University of Dayton.